More than 120 David Bowie fans packed in to the University’s Knights Park bar on Saturday 7 January for a gig performed by tribute band Thin White Duke. Bowie, who had kept his cancer hidden from the public, succumbed to the disease a year ago on 10 January 2016. Following a sell-out gig in May – held exactly 44 years after he had performed as Ziggy Stardust at the University’s Penrhyn Road campus – Thin White Duke returned to commemorate Bowie a year after his untimely death on what would have been his 70th birthday weekend. In response to enthusiastic feedback from fans who attended the event in May, Professor Will Brooker once again fronted the band for a selection of the numbers. 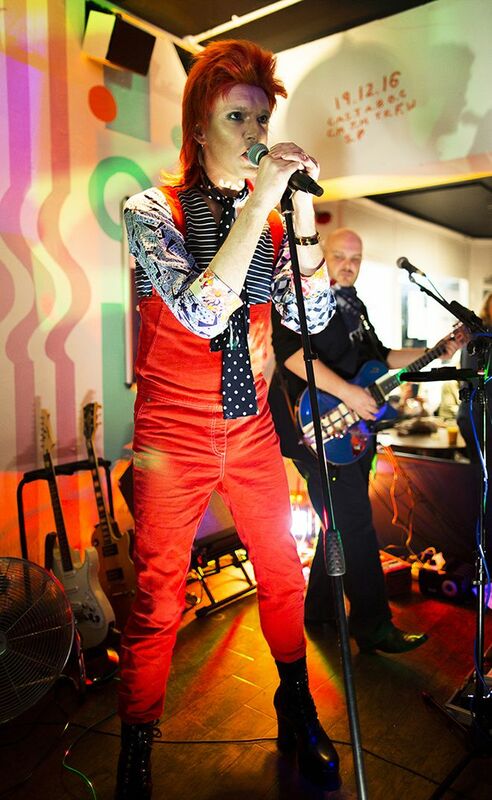 After belting out Suffragette City, The Jean Genie and Rebel Rebel dressed in a replica of the famous orange Ziggy Stardust dungarees, he later sang ‘Let’s Dance’ attired in a new, yellow suit reminiscent of Bowie’s smart 1980’s look and joined Thin White Duke lead singer Scott Fuller to perform Heroes. Professor Will Brooker, dressed as Ziggy Stardust, fronted the band for a selection of numbers at the tribute gig.Professor Brooker said that as well as celebrating the music legend’s work, the gig – held alongside the publication of his new academic book entitled Forever Stardust: David Bowie Across the Universe – also marked the end of his immersive Bowie research project. Ahead of writing Forever Stardust, Professor Brooker spent a year attempting to acquire an original understanding of his hero’s creative thought processes by transforming himself into Bowie, spending a few months at a time experiencing specific periods in the star’s life. This research process was documented in an hour-long film, called ‘Being Bowie’ which will be screened at the University on Wednesday 25 January. Professor Brooker will be giving an inaugural lecture on Wednesday 18 January, entitled ‘The death and resurrection of David Bowie’ but said it would be a ‘walk in the park’ compared to performing live on stage. “Giving a lecture is my usual day job whereas trying to do justice to one of the greatest pop artists of all time is very nerve-wracking,” he explained. He said he hoped the fans would feel it had been a fitting tribute. “We wanted to show our appreciation for Bowie’s incredible contribution to our culture,” he added. Find out about the screening of ‘Being Bowie’ and about Professor Will Brooker’s inaugural lecture ‘The death and resurrection of David Bowie’. Kingston Lib Dems are in chaos after refusing to back down on controversial changes to parking permits in the borough, instead announcing an amended scheme which has been blasted by residents as ‘hap-dash and ill-thought-out’. The proposals would have resulted in a 350% hike in the cost of a parking permit for some residents in the borough, whilst newly purchased Teslas would get to park for free. Instead, amended proposals announced today mean that cars will, this year, face a cost of up to £245, up from the current £90, but down from the proposed £465. In a press release explaining the rationale for the latest amendment, Councillor Hilary Gander said: “I believe that differential parking is one measure that will go towards achieving [cleaner air in Kingston]. The ruling Lib Dem administration has, refused to rule out increasing the charges again next year, and have not announced how they are plugging the £525,000 gap this will leave in their budget for this financial year. New Malden resident Angie, who lives in Queens Road, said: “It’s clear to me from what the Lib Dems have written that they fully intend to increase permit costs again next year – it’s not a case of ‘moving too fast’, it’s a case of these charges being discriminatory and unfair. Campaigners who set up a group to attempt to halt these proposals say that this latest amendment will not reduce local opposition to the plans, and are urging residents affected to attend Full Council at the Guildhall next Wednesday, starting at 7:30pm, where they have forced the Council to debate the issue by raising a community motion.